Has died. Let’s not flout him. Instead, to the bookstores! Let’s go! At the moment I’m on a hand-me-down chain for The New York Times, which I don’t see regularly, in full, or soon.. So I just read the December 27, 2018, obituary (p. B12) for Larry Eisenberg, who died on the 25th a few days after his 99th birthday, a Ph.D. in electrical engineering from the Polytechnic Institute of Brooklyn, a director of the Rockefeller University electronics laboratory, a co-developer of a battery-operated cardiac pacemaker when earlier models were, well, wired. His name meant iron mountain. No, not “Lawrence”; that’s laurel, “used by the ancient Greeks to crown the victors in the Pythian games…. Later, a crown of laurel was used to indicate academic honors.” No, that’s not from the Times, it’s Webster’s Second (I have the 3-vol. ed’n of 1949, among other dictionaries), accept no substitutes. Dr. Eisenberg published fifty stories in our field, about Clarot in Dangerous Visions (1967), which the Times duly acknowledged “the noted anthology edited by Harlan Ellison”; and in Amazing, Asimov’s, Fantastic, Galaxy, If, The Magazine of Fantasy & Science Fiction, Venture, Vertex, Worlds of Tomorrow. Parallel universe! There we are again! The Times, wanting to end with one of his limericks, unfortunately quoted him in a six-letter expression that would not have helped Ellison’s lit fuse. I shan’t end there. On paper his obituary was headed “Larry Eisenberg, 99; His Well of Limericks Never Ran Dry”. That’s good. But the electronic version has “Larry Eisenberg, 99, Dead; His Limericks Were Very Well Read”. I bow. This entry was posted in Poor Trufan's Almanack and tagged John Hertz, Larry Eisenberg by Mike Glyer. Bookmark the permalink. 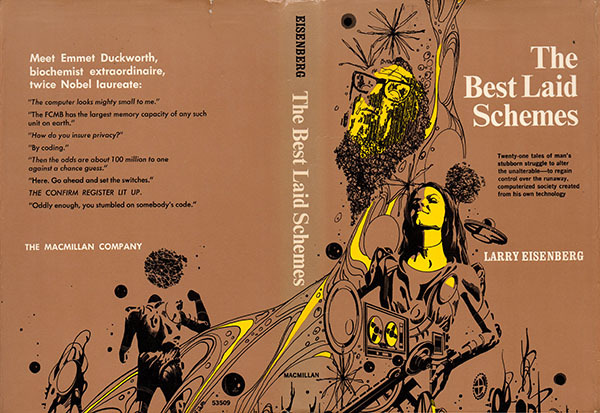 Time to dig out my copy of Best Laid Schemes from 1973 and reread it; rest in peace, Larry.